"Venetian cooking is arguably the most interesting in the whole of Italy. The city is a maze of canals and waterways that run from the Adriatic, which made it the perfect trade pathway for the Ottoman Empire. You can still see these influences in dishes like this ragu, which combine classic Italian cooking and Middle Eastern spicing. The combination of duck, red wine, orange and cinnamon, cooked long and slow until the duck falls off the bone and the fat clings loosely to the meat, create a full bodied but gently spiced sauce that slips over pappardelle like a dream." 1. First, brown the duck legs. Heat a frying pan with a little glug of olive oil. Duck is very fatty so you don’t need to add much oil to the pan at this stage. Season with plenty of salt and sear on both sides until they are a nice deep golden colour all over. Remove the legs from the pan and leave to one side. 2. In a heavy bottomed casserole heat the rest of the olive oil over a medium heat. Add the onions and cook for about 20 minutes, until they are nice and soft. Add the garlic and sweat for a couple of minutes. Next, add the wine and allow to bubble for a few minutes to cook off some of the alcohol, before pouring in the blitzed tomatoes and stock. Add the duck legs, followed by the bay leaves and cinnamon, and a good pinch of salt and pepper. Cover with a lid, turn the heat right down and allow to simmer gently for 1 hour 30 minutes. 3. Once the cooking time has passed you will see that the sauce has reduced and become lovely and rich. At this stage remove the duck legs from the pan. Let them cool for a couple of minutes, and then use two forks to pull the meat from the bones and shred it a little. Discard the skin as it is only delicious when rendered crisp. 4. Return the duck meat to the sauce and add the orange zest and juice, the celery salt and pepper. Check for seasoning and let the sauce cook for a further 10-15 minutes. 5. At this point put your pasta on. 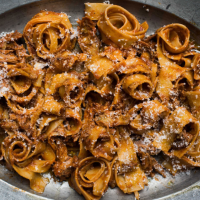 Pappardelle is the only pasta to eat with ragu as its large flat surface is perfect for holding the sauce. When cooked, drain the pasta and reserve a little of the cooking water. Combine the pasta with the sauce, and add one or two tablespoons of the cooking water. Divide between bowls and serve with a generous grating of Parmesan.